Walt Disney World have launched a competition to find a UK twin town for the Florida Resort park. From now until 22 November 2009, anyone in the UK (over 18 years) can nominate their home village, town, city or 'hamlet' to become the Walt Disney World twinned town by visiting www.waltdisneyworldtwinnedtown.co.uk. The winning location will be announced as having official “Walt Disney World Twinned Town” status and arrangements will be made to hold a magical Disney party in January to celebrate the twinning. Furthermore, the person who submits the winning nomination will jet off to Disney World in Florida with their family for the official twinning ceremony presided over by the mayor of Main Street, U.S.A.
To make a Disney World UK twin town nomination, users can use words photographs or video. 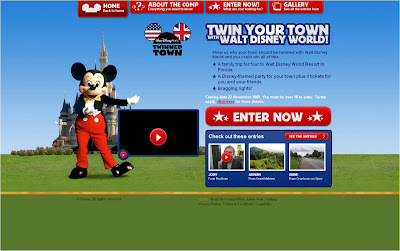 Entries are uploaded to the Disney World UK twin town competition site and a gallery shows entries so far - with current submissions including Dundee, Sudbury, Pontypridd and Ealing. The Disney World UK twin town winning entry will be determined by a judging panel rather than public vote and the judges include TV star Angellica Bell, Vice President Creative Inc, Walt Disney World Duncan Wardle, Vice President and managing director of Disney Destinations International UK Hugh Wood, and one of the famous Walt Disney Imagineers, Patrick Brennan. Another example of how a competition can be turned into an online (social?) event - doing something to 'Drive The Conversation' and receiving traffic and attention in return.